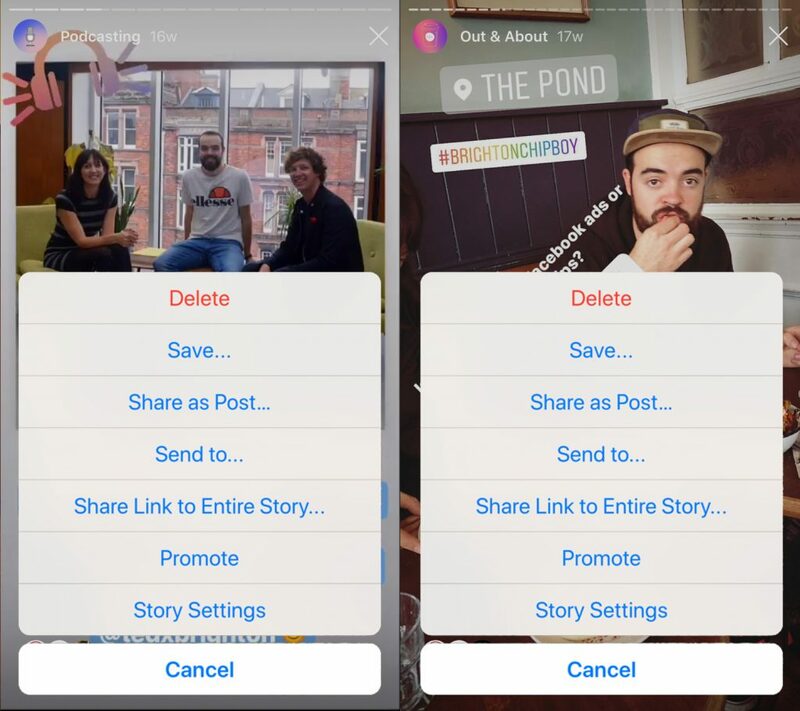 Instagram is testing a new option that will allow people to share URL links to entire Stories. Stories are great for displaying ‘in the moment’ and behind the scenes content. They give people a snapshot of what is happening ‘right now’ and are often seen as more authentic than a polished Instagram feed. Businesses are experimenting more and more with Stories as a way to promote themselves. This new ‘Share link to entire Story’ option will help brands increase reach outside of the Instagram itself. When this rolls out more widely we’ll find out more about how it’ll work in practise (i.e. will the link expire when the Story does?). We’ll also see some more data about how it affects the reach of Stories. Stay tuned. What could this do for me? This could be a great way of attracting people from other social media channels to grow your Instagram following. Think carefully about the Stories format and how to use it creatively. For example, if you’ve written a blog about an event you’ve attended, why not support it with a link to your Instagram story. Try to give people something they’re not getting from your other marketing materials. And remember you can always come along to our Instagram course if you really want to up your game! Late last year Instagram introduced a new Promote option for its Stories format. Tap the three menu dots when in your Story and you can select Promote. A bit like with Facebook Boost, this allows you to pay some money and see your post increase in reach. This is a simple way of getting used to social advertising. Promoting or Boosting posts may be simple to do but this technique is far less effective than using the Facebook Ads Manager (which also drives Instagram advertising). Instagram has released Promote as a way of helping you get comfortable with spending money on their platforms, and to get a taste of the various ad options that exist. However, there are restrictions. It won’t allow you to promote Stories that include tappable elements, or those with low video resolutions. It also doesn’t like it if you’ve used certain third party camera effects of if the Story was created too long ago. We’ve seen a big rise in the number of people coming on our Facebook and Instagram Advertising course recently. If you decide you’d like to start spending money to promote your Stories on a regular basis, we’d definitely recommend coming along. We’ll teach you how it all works and show you lots ways to spend less and get better results. These skills could be useful even if you’re not marketing a traditional business. We’re seeing more and more people make money by becoming influencers and/or social media content creators.